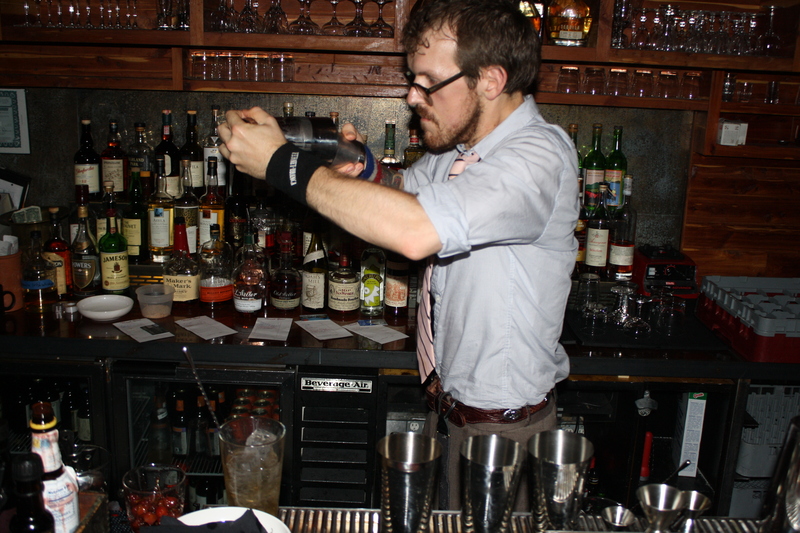 Nicolas de Soto, bartender at Dram and Painkiller, is leaving NYC for London later this month. For as long as the craft of bartending has been a viable career, the opportunity to travel has been one of its biggest perks. We know that Jerry Thomas, father of the American cocktail, spent time in San Francisco, New Orleans, and Chicago, in addition to New York, and that Harry Craddock found refuge at London’s Savoy Hotel during Prohibition. And few books have been as influential to today’s bartenders as Charles H. Baker’s Jigger, Beaker, and Glass: Drinking Around the World, which chronicles the author’s favorite drinks sampled on every continent. Bartenders travel not just for the exotic romance, but to add new techniques and nuances to their repertoire, not to mention new flavors and recipes. Parisian Nicolas de Soto, bartender at Dram and Painkiller in New York for the past six months, is following the tradition of the traveling bon vivant, and will soon be leaving us for London later this month. Nico has made quite an impression on the cocktail community here, not just due to his disarming accent, but also for his poise behind the stick, undoubtedly polished over the years at several bars around the world. He first got into bartending in Paris in 2005 at a high-volume bar not known for its cocktails before moving on to a bar where he learned the Parisian “classics” at the time: Blue Lagoon, pina colada, mojito, caipirinha, etc. 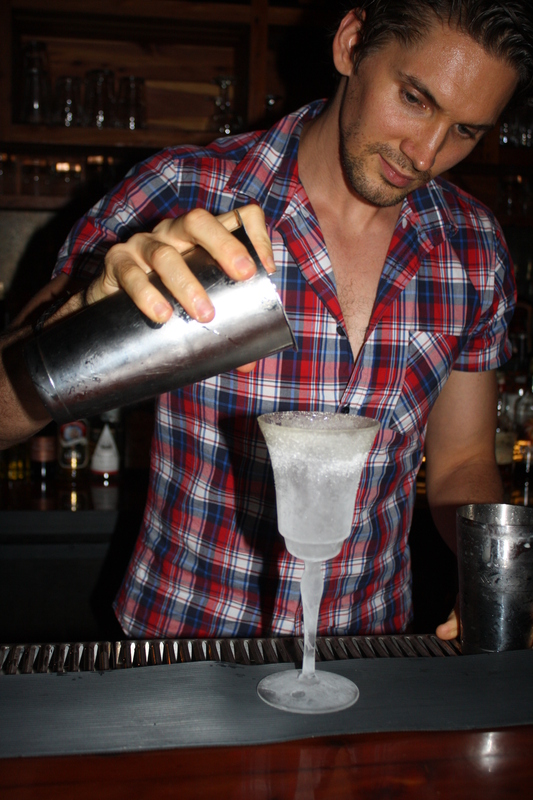 In 2007, he moved to Australia, where he had lived previously, and delved into more serious cocktails in Melbourne. After a year he returned to Paris, working in China Club, a serious cocktail bar in Bastille, and then he managed the bar at Mama Shelter (a Philippe Starck-designed boutique hotel) before joining Paris’ most respected cocktail bars, the Experimental Cocktail Club and Curio Parlor. Before moving to NYC and utilizing his connections to get the job at Dram, Nico traveled through Peru, Ecuador, Colombia, Panama, Costa Rica, Nicaragua, Cuba, Guatemala, and Mexico before flying to Vancouver for the Winter Games where he worked as a guest bartender. Other than bartending, tennis, and cinema, Nico’s passion is, you guessed it–travel. He says of the 51 countries he’s visited, his favorites are Australia, New Zealand, Japan, Argentina, Indonesia, Bolivia, Peru, French Polynesia, and Singapore; while his favorite cities are Paris, NYC, Vancouver, Melbourne, Sydney, London, Berlin, Singapore, and Barcelona. 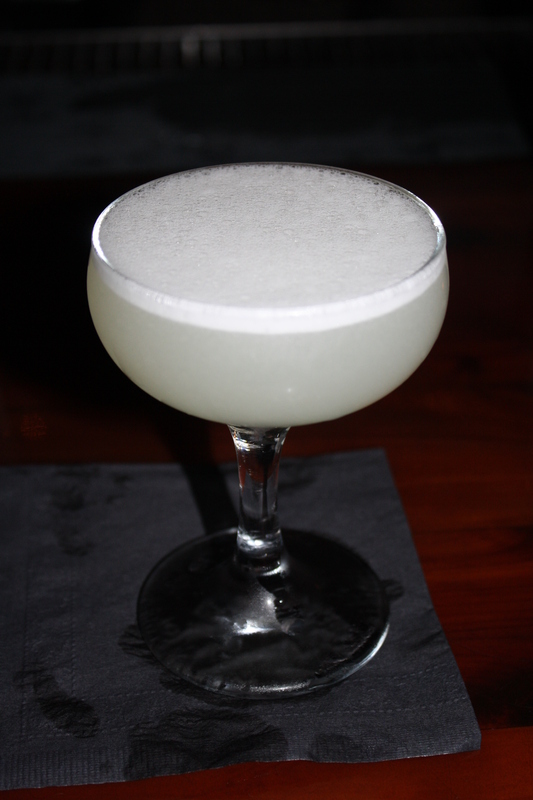 A: Either a whole glass of fresh grapefruit juice or a well made fresh daiquiri (2 oz. Chairman’s Reserve rum, 3/4 oz. fresh-squeezed lime, 1/2 oz. cane syrup). I don’t like beer, sadly. A: Noah’s Mill 15-year-old bourbon. Just discovered it recently and I love it. • Milk & Honey: Magic place, the Michael show. I haven’t seen Sam at work yet. It’s Sasha’s. It’s where everything started. 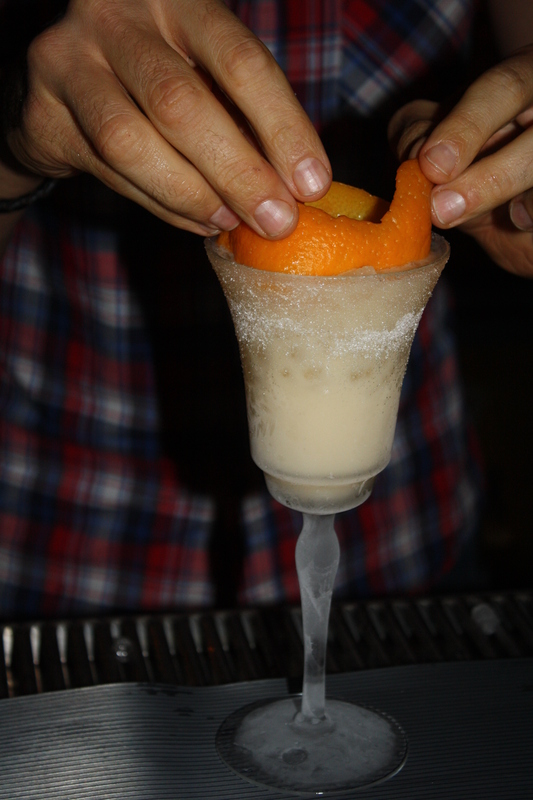 • Death & Co: You’ll never be bored, amazing drinks, and some of the most talented bartenders on Earth. I always bring my friends and dates there. • My rooftop: 360º view, two blocks from the East River in Williamsburg, the Manhattan skyline view is amazing. • McCarren Park: Tennis court and grass, what else? • Paris of course — my friends, my family, my heart. A: Bartenders I work with, meet, and watch. Bars I visited. The countries I visit. I visited 51, worked in five, spent two years in Australia. People, no books — people. 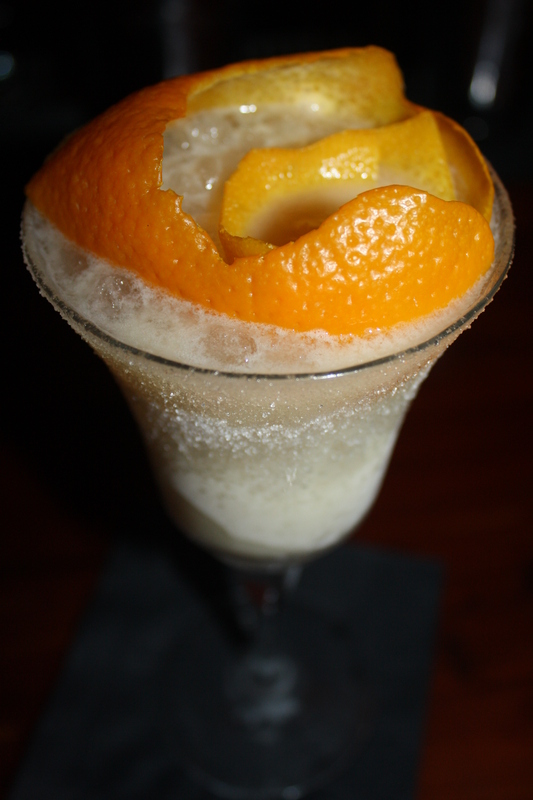 A crusta calls for an elaborate citrus peel garnish. Nicolas de Soto's "Tiki Crusta" at Dram: Pierre Ferrand cognac, Citadelle gin, lime juice, homemade orgeat, orgeat sugar, tiki bitters and orange peel garnish. Nico’s going-away parties are at Painkiller this Wednesday night and at Dram on Sunday night. Bye Nico, you will be missed! If you haven’t yet wandered down the narrow Chinatown street leading to the former opuim den-turned-Parisian-style apothecary bar Apotheke, you really are missing out on one of New York’s most hidden treasures. If you are lucky, you’ll open the ornate doors to see 2009 Star Chefs Rising Stars-winning mixologist Orson Salicetti behind the bar in his lab coat, mixing his exotic tinctures and infusions (made from ingredients such as dried fruits from Corsica) into dizzying treats. Orson, who grew up in Caracas, Venezuela, developed his culinary approach to cocktail making thanks to the influence of his mother, a chef and restaurateur. He moved to NYC in 2001, and after a stint in Miami, he returned to New York to tend bar at Rayuela and Islero, where he met Albert Trummer. Albert, an Austrian bar chef/master mixologist, is the propietor of Apotheke, and Orson, as head bartender, is the backbone of the operation. Orson says he appreciates Albert’s innovative approach to mixing drinks and for giving him the freedom to source fresh, rare ingredients. Watching Orson mix drinks, and knowing that he made his modifiers by hand, it is clear that he takes an artistic, if not poetic, approach to the craft. For his Tomato Basil Martini recently served at the Star Chefs gala, Orson first rimmed the glass in a mix of Himalayan salt, fennel seeds, star anise, and sambuca–and that was just the garnish! A: A glass of water (I prefer sparkling water with a lemon) and an espresso. A: My own Negroni (Plymouth Gin, Antica Formula Carpano, and Campari with my own bitters and an orange zest). A: For my liquors I have a special edition Santa Tereza Rum, I also have a Corsica dried fruit bitters I love, and sweet plum. A: My dad and my grandfather. A: I usually sleep around six hours, and a lucky night seven. During vacations, all day! A: Union Square Greenmarket, where they have the best selection of fresh botanicals, fruits, and vegetables. A: First from my mentor, my mother, and second from the kitchen–aromas, flavors, and memories. A: Sparkling water with a fresh lemon inside. A: My Japanese jigger (it’s a very special present). Orson Salicetti's "Tomato Basil Martini" with cherry tomato water, basil, gin, Lillet Blanc, agave-lime syrup, hibiscus bitters, peppercorns, and Himalayan salt rim. 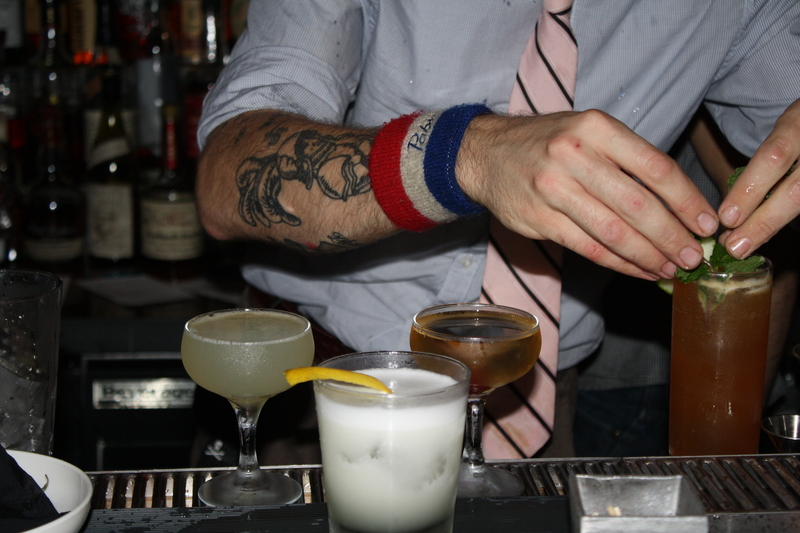 There are plenty of talented female mixologists in NYC, but do you know who they are? Thanks to mentors such as Audrey Saunders of Pegu Club, Julie Reiner of Clover Club, Charlotte Voisey of Hendrick’s Gin, and Aisha Sharpe of Contemporary Cocktails, there’s a slew of bartenders shaking things up in the boy’s club. Since the days when women were not allowed in bars to more recent times when bartending involved more bouncer-type duties and heavy lifting, female bartenders have had to work hard to be taken seriously as mixologists. Now that mixing drinks is more about flavor combinations and individual style, there’s no reason why a female bartender can’t make a cocktail that tastes just as good (if not better) as one a man would make. When she is not mixing cocktails, Meaghan contributes to several publications as a spirits journalist, and she’s even a fellow blogger, with SpiritMeAway.com, and a fellow Examiner. Formerly the spirits/leisure editor of KING magazine, she has also contributed to Penthouse, XXL and Vain magazines. Meaghan began bartending in New Haven, Conn., while attending Southern Connecticut State University. She moved to New York six years ago and has juggled bar gigs with stints in the music and media industries. If you want to visit Meaghan at Raines Law Room (48 W. 17th St.), keep in mind that the lounge has 45 seats, so call ahead and make a reservation, 212.242.0600. A: A big glass of water immediately followed by a bigger cup of coffee. On a hangover day, for some reason I crave Pepsi in a can. A: After a long night I like a stiff, sipping drink. Lately I’ve been drinking an Old-Fashioned variation that is equal parts Zacapa 23 and Elijah Craig 18 with some peach and angostura bitters. We call it an “Amber Old-Fashioned,” after the cocktail server I first made it for. A: I love Martin Miller’s Westbourne, and it’s great for making simple but tasty drinks at home. A: Ada Coleman (former leading lady of The American Bar at the Savoy Hotel) and my lovely twin because she is always a good time and I don’t get to see her enough. • Milk & Honey: Because I always enjoy the Mickey and Sammy show. • Death & Co: Love a place with great drinks and food. Even my friends that don’t care much about cocktails are always impressed and have a great time. A: A lady needs her beauty rest! I always try to get 6-8 hours of sleep. A: We are lucky to be so close to the Union Square Farmer’s Market. We had a lot of fun buying local fruit and syrups this summer. A: Really anywhere, but especially seeing what people drink in old movies and books. I like reading old recipes and adjusting measurements and ingredients to make it something I really love. A: It would have be something easy to drink neat, and I think a nice aged rum would fit the bill. I love aged rums that a have coffee/chocolate profile like Zacapa XO and Diplomatico Reserva Exclusiva. A: I’m not superstitious about anything, but I do have a habit of collecting way more cocktail glasses than I’ll ever use. A: Not so much for when I’m out (I’m lucky to have Irish drinking genes), but my friend has a saying I’ve adopted about the day after a night of alcoholic indulgence being a “Hologram Day” because you’re barely there. Meaghan Dorman's "Amber Old-Fashioned" with Zacapa 23, Elijah Craig 18, angostura bitters, peach bitters, and demerara sugar cube.